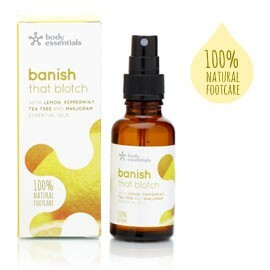 Banish that Blotch is created using tea tree, peppermint, marjoram and lemon, which together form a non-toxic, non-irritant oil blend. Tea tree provides an effective immuno-stimulant, which fights against infectious bacteria, viruses and fungi. Peppermint acts as an antiseptic, analgesic and anaesthetic. The use of marjoram adds fungicidal properties, while the cleansing, rejuvenating elements of lemon stimulate the bodys natural defence mechanisms. Lemon is phototoxic, which means it cannot be applied to the skin before sun exposure. Pour a small amount of oil into the palm of your hand and massage into the affected area 2-3 times per day. When applied to verrucae, it is not recommended that the patient removes dead skin from the surface of the affected area beforehand.